Can Cam Newton win his first playoff game as a pro? This is perhaps the most exciting game, coming from as objective a standpoint as I can provide, there is all weekend. It’s a face-off between two truly elite teams, defensive powerhouses, who played in a game earlier this year that was decided by just one point. The Panthers are looking for their first berth in the NFC Championship since they lost to the Seahawks back in the 2005 playoffs, while the 49ers are looking for their 3rd straight bid in the title game. Both teams are riding hot streaks, the 49ers having the longest current winning streak in the league at 7 games, while the Panthers have won 11 of their past 12 after starting the season 1-3. Both teams have above average rushing attacks and rely on ball control and sound defensive play to win games. Knowing this, let’s delve into who has the edge in various aspects of the game. In the middle of the field for the Panthers, Luke Kuechly has been and was a superstar, anchoring that second-ranked run defense that gave up just 105 yards rushing to the 49ers in their first game. What was most impressive, however, was the Panthers’ stifling of Kaepernick, holding him to just 91 yards passing, with no touchdowns and an interception. 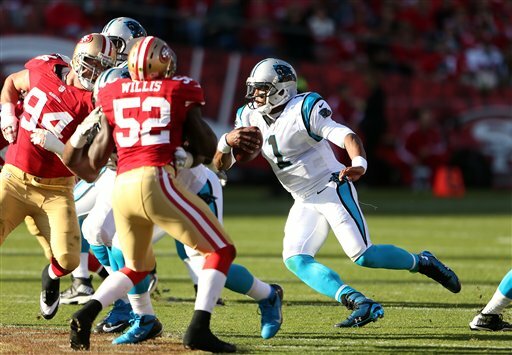 Carolina had an astounding 59.0 sacks during the regular season, the most in the NFC and second-most in the league. Leading the way for the pass rush was Greg Hardy with 15.0 sacks, but Charles Johnson on the other side of the line was no slouch either, notching 11.0 sacks in just 13 games. Facing #7 is a different story than most of the signal-callers they’ve played this year, however. If the Panthers want to contain Kaepernick on the ground (the man averages 90 yards per game rushing in the playoffs, at over 11 yards per carry), Hardy and Johnson will have to sacrifice some of their corner-turning explosiveness to make sure they provide no holes in the pocket for Kaepernick to escape through, should the pressure start to get to him. For the most part, the Panthers did just that in their previous meeting, holding the third-year passer to just 16 yards rushing while sacking him five times. The discipline of that All-Pro-caliber front seven will go a long way in deciding who comes out on top in this one. On the other side of the ball, Cam Newton has continued to grow as a quarterback, posting career bests in passer rating, passing touchdowns, and completion percentage this season. His career total of 92 touchdowns is second only to Dan Marino’s 100 when it comes to offensive production through a passer’s first three seasons. He’ll need to play better, however, than he did the first time he faced the 49ers’ stingy D. In that game, he completed just 50% of his passes for 162 yards, with no touchdowns and a pick. If Steve Smith is healthy, he’ll be a factor and help Newton out in that endeavor. The man steps up big in playoff situations, there’s no doubt (he has 782 yards and 7 TDs in eight playoff appearances). His production may have waned slightly from its previous heights, but he still has an explosion to his step that can catch cornerbacks off-guard and change a game. The 49ers secondary, including Pro Bowlers Donte Whitner and Carlos Rogers, as well as team interception-leader Tarell Brown (5 INT), must continue to defend through the air well to assure this game is the kind of battle Jim Harbaugh is looking for – tough, close, defensive, and decided in the trenches. The oddsmakers have the 49ers as slight favorites going into this game by virtue of their not having lost since mid-November, but seeing as it’s such a close call, and seeing that the Panthers won in San Francisco earlier this year, I’m going to take Carolina. The defense has been playing well, and the front seven plagued Kaepernick all game last time. I don’t expect that to change, especially with 70,000 roaring fans to aid the cause during this go-around. It’ll be a close game, but with such an even matchup, you have to go with the home team.